Download a PDF to read the article and check out this online only follow-up to the story. The highly acclaimed Brooklyn-based quartet So Percussion performs Saturday, March 10 at 8 p.m. in the Lawrence Memorial Chapel as part of Lawrence University’s 2011-12 Artist Series. Tickets, at $20-22 for adults, $17-19 for seniors and $15-17 for students, are available through the Lawrence University Box Office, 920-832-6749. So Percussion members (l. to r.) Adam Sliwinski, Eric Beach, Jason Treuting and Josh Quillen. Formed at the Yale School of Music in 1999, the group has been hailed as an “experimental powerhouse” by The Village Voice. Described as “astonishing and entrancing” by Billboard Magazine and “brilliant” by the New York Times, So Percussion is known for their innovative, original music as well as its collaborations some of today’s most exciting composers, among them Baltimore “electro-freak” Dan Deacon, electronic collage duo Matmos and Academy Award-nominated film composer Martin Bresnick. 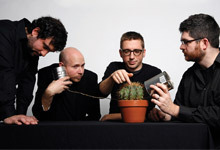 So Percussion — Eric Beach, Josh Quillen, Adam Sliwinski and Jason Treuting — has performed their eclectic blend of unusual music throughout the United States, including the Lincoln Center Festival, Carnegie Hall, Brooklyn Academy of Music, the Cleveland Museum of Art, as well as on tours to Australia, Russia, the Ukraine and throughout Europe. Using innovative technology, Lawrence University President Jill Beck conducted the college’s first-ever phonecast March 1, creating the largest alumni event in the college’s history. Nearly 4,000 alumni, parents and friends of the college from across the country participated in a personal one-on-one conversation with the president. President Beck conducts the college's first-ever phonecast with alumni and friends of the college. 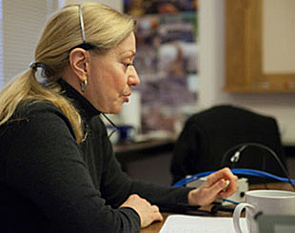 During the 30-minute phonecast, Beck, who announced in February her plans to retire as Lawrence’s president in June, 2013, discussed her priorities for the final 16 months of her tenure and fielded nearly a dozen questions from callers in Washington, D.C., New York City, North Carolina, Boulder, Colo. as well as Appleton and Neenah. The president addressed questions ranging from her proudest accomplishment to issues of diversity on campus and the relevancy of a Lawrence liberal arts education in preparing students for careers in today’s economy. She said her focus for the remainder of her presidency would center on strengthening Lawrence’s innovation and entrepreneurship program, improving athletic facilities, enhancing an emerging interdisciplinary film studies program and growing the Lawrence Annual Fund. 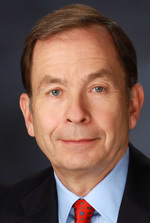 Beck was joined on the phonecast by Terry Franke ’68, chair of the Lawrence Board of Trustees, who, in response to a question regarding the search for Beck’s successor, outlined the process and time frame for having Lawrence’s 16th president on board by July 1, 2013. As part of the phonecast, participants were invited to respond to a series of poll questions related to institutional priorities, student recruitment and technology by touching appropriate keys on their phone pad. Baroque composer Henry Purcell’s opera “The Fairy Queen” receives a modern adaptation in Lawrence University’s production of the fantastical tale of romance and magic. The opera will be performed March 1-3 at 8 p.m. and March 4 at 3 p.m. in Stansbury Theatre of the Music-Drama Center. Tickets, at $10 for adults and $5 for senior citizens and students, are available through the Lawrence University Box Office, 920-832-6749. Originally written as a “masque” — light entertainment featuring lavish costumes and scenery but nearly devoid of narrative — the opera was inspired by Shakespeare’s “A Midsummer Night’s Dream.” The story follows four young lovers’ escape to an enchanted forest. The updated adaptation, written by Professor of Theatre Arts Timothy X. Troy ’85, who also serves as the production’s director, replaces the anonymously written libretto with Shakespeare’s own words. “I restored the actors’ text to the First Folio version before shaping a narrative that closely followed the story of the young lovers who are tricked in the forest by Puck, the most famous of all fairies,” said Troy. His adaptation was inspired by the psychedelic cover art of fairies on an LP of English composer Benjamin Britten’s 1973 recording of “The Fairy Queen.” It transports the action to a hippie commune in the woods outside Athens, Ga., immediately after a tornado. The new and modern setting offered creative opportunities for the production team. Costume designer Karin Kopischke ’80 playfully explores the eclectic fashions of hippie culture of the commune-dwelling fairies against the academic preppy and jockish culture of the quartet of young lovers and their pursuit of true love. Rebecca Salzer, Lawrence Fellow in Dance who served as choreographer for the production, worked closely with a corps of six dancers to blend Purcell’s set dance pieces with popular dance forms from the 1960’s and early 1970’s. Because Purcell’s “The Fairy Queen” is considered a “semi-opera” — an amalgam of scenes from Shakespeare’s “A Midsummer Night’s Dream” and musical interludes — it presented special challenges and opportunities for Bonnie Koestner, associate professor of music, who served as the production’s vocal coach. Featuring some of the most famous music of the Baroque period with virtuosic arias and complex ensembles and choruses, “The Fairy Queen” offers its audience a stunning variety of vocal talent alongside innovative choreography and compelling acting. “It’s a delight to integrate the talents of our strongest actors with those of our accomplished singers,” said Troy. President Beck shares a message with the Lawrence community. It is with great sadness that I share with you today the news of the death of Professor Emerita of Music Mari Taniguchi, who passed away Monday, February 13 at her home in Appleton. She was 92 years old. A native of San Diego, Calif., Mari joined the Lawrence Conservatory of Music in 1961 as a voice teacher, mentoring scores of aspiring young singers during a 39-year teaching career, retiring in 2000. She was a graduate of Eastman School of Music, earning a bachelor’s degree in both voice and piano, and a master’s degree in music literature. As a teacher and vocal coach, Mari was both exceptional and exceptionally demanding, establishing a well-earned reputation for excellence of diction and musical phrasing. The high standards she set for her students were rewarded with distinguished careers for many of them, most notably Grammy Award-winning baritone Dale Duesing ’67, American Song Contest winner William Sharp ’73, and Metropolitan Opera Audition winner Mark Uhlemann ’96. 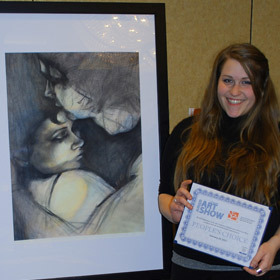 Numerous other students under her tutelage won awards and fellowships from the National Federation of Music, the Watson Foundation, and the Fulbright Foundation. For many years, she served as conductor of the Downer Chorus for Women. Mari enjoyed a distinguished performance career before arriving at Lawrence. She made her operatic debut in the title role in “Madame Butterfly” in Turin, Italy, and later performed in Malta, Milan, Rome and Venice. She also sang as part of Robert Shaw’s Chorale for broadcasts on NBC and CBS and performed on some of Toscanini’s legendary recording-broadcasts of operas and orchestral works. In addition to her considerable musical talents, Mari was an amateur gourmet who took great pride in her culinary skills. She frequently invited her students to her home for dinner, and always the teacher, was generous in providing pointers on how they should handle themselves in the kitchen. Mari was a dear friend to many at Lawrence. We sincerely sympathize with the loss felt by them and by her former students and share in it. Both Rob and I were the grateful beneficiaries of Mari’s welcoming and cheerful attitude, and the many delicious gifts that she ambitiously created in her kitchen. We always enjoyed and looked forward to her warm and lively company. Mari will be greatly missed and remembered with deep affection. She is survived by two nephews and a sister-in-law, all of whom live in California. A memorial service celebrating Mari’s life is tentatively scheduled this spring in the Warch Campus Center. Details to follow. 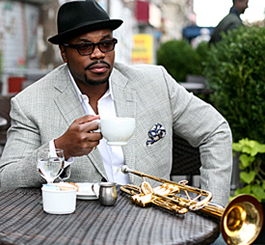 Award-winning trumpet player Jeremy Pelt and his four-member band make their Lawrence University debut Friday, February 17 at 8 p.m. in the Lawrence Memorial Chapel as part of the college’s 2011-12 Jazz Series. 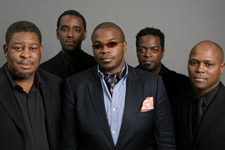 Since its formation in 2007, the Pelt Quintet has emerged as one of jazz’s top-tier mainstream performers. The band recently returned from an international tour that took them throughout Europe as well as Turkey and India and celebrated the release of their fourth album, “Soul,” which features six works written by Pelt. A California native who began playing the trumpet in elementary school, Pelt has earned the repeated praise of DownBeat and the Jazz Journalist Association, both of which have named him a “rising star” on trumpet five years in a row. His early focus was on classical studies, but in high school his interests in jazz emerged. He went on to study jazz performance and film studies at Boston’s Berklee College of Music. He played his first professional gig with the Mingus Big Band and since making his home in New York, Pelt has performed with jazz icons Roy Hargrove, Ravi Coltrane, Greg Osby and Cassandra Wilson, among others. In addition to leading is own band — tenor saxophonist J.D. Allen, pianist Danny Grissett, Dwayne Burno on bass and drummer Gerald Cleaver — Pelt is member of the Lewis Nash Septet and The Cannonball Adderley Legacy Band featuring Louis Hayes.